Like just about everyone, I often think of bands in terms of the other bands of which they remind me. For Pinback, I picture them as a West Coast Sebadoh. Even though it’s meant in the most admiring way, such a classification is not fair because it may make it sound like they’re somehow aping the discordant yet melodic Bostonians who like their Splatter Technique lyrics with healthy doses of punk guitar and punker feedback. Plus, there’s the whole repetition thing that Pinback takes much further than Lou and the gang: chords, chorus, repeat. 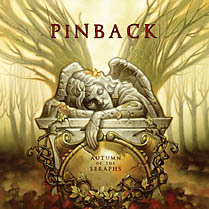 You can hear it all the way through Pinback’s discography and right up to their most recent, Autumn of the Seraphs. And contrary to every track sounding the same, each one finds a new way to make the same old thing sound totally original. No wonder Pinback’s following is so loyal. Check out a new track and some older ones, then check out Pinback guy Rob Crow, whose recent solo release kinda-sorta sounds like Pinback but kinda-sorta covers even more new territory. For those who consider “indie” a genre rather than just a classification, it’s probably such lo-fi, wounded-guy sounds as Sebadoh, Built to Spill, and Modest Mouse that come to mind when you hear the “I” word. But don’t forget about Pinback, who return to rock your world — well, that may be a bit overstated — with some loopy, melancholic, melodic pop. What’s new is “indie” again on the splendid single “Fortress.” The others are just for nostalgia’s sake. Anyone with good Musical taste has to like Pinback, considering all other bands these guys pull through with amazing musical talent, that raises above all other Music other than just rock! It was great to hear pinback at The Oc. The best sound that I've ever heard there. music on a cd to listen. pinback has got to be my most favorite band, ever. i'm so glad i'm from san diego and i get to sample them live two to three times a year. thanks for the good sampling and nice blurb. They are also getting good airplay here on Triple J (National anti-commericial music station). yessss, pinback is so awesome. non photo-blue is my absolute favorite. it gets better every time. Pinback is great. I remember the first time I heard 'Tripoli', I was floored. I saw them live at Coachella a couple years back and they didn't look at all like I had imagined them. The one dude looks like he belongs in a punk band, not singing lovely indie pop. 3hive has become my new internet haven. im thrilled you listed pinback. I'm wary of listing importance to bands, but they're really my favorite band as of yet. Good stuff! Really digging "From nothing to nowhere" right now. Emperors new clothes. This band has been forgotten by the time I hit post. Whoo HA! More Touch and Go! Lovve it, love it, love it.